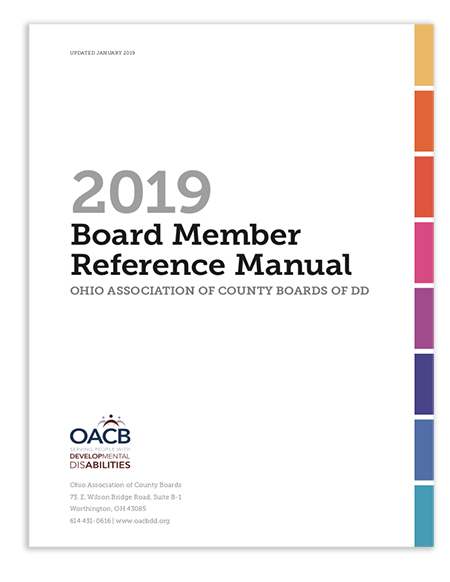 A PDF copy of the Board Member Reference Manual can be downloaded via the Document Center of OACB MemberConnect – to download a PDF of the complete manual, click here (download will start immediately upon log-in). Individual sections of the Board Member Reference Manual may also be downloaded within the Board Members tab of the MemberConnect Document Center or by clicking on the links above. NOTE: Reference manual access is reserved for board members, superintendents, and superintendents' assistants only. Page 1-2: New welcome for county board of DD members from OACB's executive director. Pages 1-6 and 1-7: Various updates and clarifications. Pages 2-4 and 2-5: Various updates and clarifications regarding OACB member services. Page 2-9: Calendar updates regarding the OACB Strategic Plan. Page 3-15: Updates to figures for the Ohio Abuser Registry. Page 6-3: Various clarifications regarding the technical aspects of levy millage. Page 6-12: Updates to figures regarding the Medicaid match rate. Page 6-13: New explanation of waiver waiting lists to reflect changes made in 2018. Page 6-14: Annual updates to services covered by various HCBS waivers.